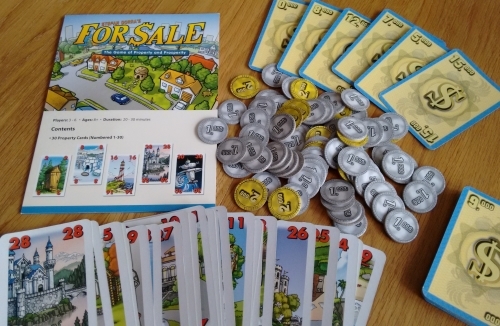 For Sale is a light family card game designer by Stefan Dorra. It takes 20-30 minutes to play, accommodates three to six players well and can be picked up for well under £20. As the name and box suggest this a game about buying and selling properties but don’t worry – there’s nothing to be scared of here, even if you don’t usually like auction/bidding games. As the game length suggests it’s not a brain burner: instead it’s light, fun and fast. Inside the box you’ll find two decks of cards (properties and cash) and a set of coin tokens. Everything is high quality, the cards linen-finish and the tokens chunky, while the cartoon art on the property cards is really charming. For Sale is a game of two halves, but both are simple to teach and learn. Even better you can teach each half when you get to it, giving players less to process and remember. Everyone starts with a handful of coins and during round one these are spent to buy properties. Once all properties have been bought (every one will finish with the same amount) they’re sold for money in round two. The aim is to finish with as much money as possible. Before each turn of round one a number of properties equal to the number of players is placed face up on the table. From their secret stash of coins players choose in turn to either up the current bid or take the lowest value card on show (and taking back half of any coins they’d bid so far). The ‘winning’ bid pays full price, but gets the best card. Once all properties are bought, round two begins. This time a number of money cards equal to the number of players is placed face up on the table; players bid for them with the properties bought in round one. There is an identical number of property and money cards; each round players bid one of their properties and everyone flips them over at once (called a ‘blind bid’). You take a money card in ascending order, the best property taking the highest value money card. The system is extremely elegant. All the property cards are valued differently (1-30) and there are two of each money card (two of each valued $0-15), meaning there is never any confusion over bids – while all the players get something each round. When all the properties are spent, you add up your money cards and see who won. These are me, plus three fictitious amalgams drawn from observing my friends, and their respective quirks and play styles. The writer: While this may look like an overly simplistic game with an uninspiring theme (pretending to be an estate agent isn’t my idea of fun), For Sale is actually one of the best ‘filler’ games I’ve played. It ticks all the boxes: good player range, easy to teach, plays fast and keeps everyone involved throughout. The thinker: I’m not prone to enjoying filler games as by their nature they tend to lack depth and strategy. If it were my choice I’d play something a more challenging, such as Hive or Blokus, but there’s no escaping the fact this is a well designed game and I’m happy to play when the occasion arises. The trasher: You mean I get to buy and sell houses?! Goodie! But seriously there is some fun to be had with For Sale, as any bidding game is an opportunity for table talk. You can also try and psyche people out a bit in the second half and I’ve seen some real silly card-slapping-the-table action when the mood is good. The dabbler: While I don’t like auction games, I do quite like this one as it has a few things going for it. First it’s great that you get something every round so never feel out of it or under pressure. Also the art is cute and for a game that plays ages 8+ that’s important – they’ve even gone the extra mile adding a different animal to each card for the younger ones (and the young at heart!) to find and talk about as you go. The most important thing to note is this is an extremely highly regarded game. With more than 3,300 players giving this a comment and an ‘out of 10′ rating on Board Game Geek you have to get past 3,150 before you find rankings below 6. Criticisms from those who really don’t like it label For Sale as “too simple” or “uninteresting” with “no hard decisions”; “too light”, or as just a “simple auction game”. To the wrong player For Sale will be all of these things, but as the numbers above show these people are the minority. I’d suggest avoiding this game only if you have a very severe reaction to one of these gaming ailments! My only real issue, and it’s a small one, is price. The current edition is well produced and nicely packaged, but at 60 cards and 72 cardboard coins the price tag seems a little steep. It has been put in quite a large box to fit into Gryphon Games’ ‘Bookshelf Series’ but could live in a box half the size (and has previously). However similar games (such as recent release Diamonds) have a similar price point and I don’t see it as a barrier to entry. I was introduced to For Sale at a London on Board gaming meetup and fell for it on my first play. It went into my collection soon after and had regular plays for a long time after. But in 2013 it didn’t see a single play, as my regular gaming groups didn’t really do old fillers; then in 2014 it returned to the table with a bang when I got involved in a local group which includes a lot of less rabid gamers. It has gone down a storm with gamers and newbies alike, rekindling my own enthusiasm for the game. No game is truly a ‘must have’, as opinions and tastes vary so much, but For Sale would certainly be a contender for a top 10 ‘Swiss army knife’ of titles that would meet all your gaming needs. I’ve played a lot of fillers before and after, but very few have the staying power of this classic. For more filler and family games check out my board game ‘Where to start‘ guide. This entry was posted in Board games, Games and tagged board game, Board game review, board games, boardgame review, card game, card game review, family games, filler games, For Sale, For Sale review by Chris Marling. Bookmark the permalink. Fantastic game. I’ve held off buying because of the price, but if price was measured in terms of gameplay (both fun and replay value) instead of component cost, this is one of the best values in gaming.